If you have adopted children into your family, you have done a wonderful thing—thank you! Some of my readers are undoubtedly ones who have been adopted, and I hope that it has worked out well for you. 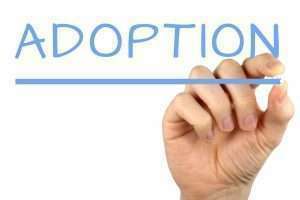 We are all familiar with how physical adoptions work, but did you know that the Bible also invites all of us to be adopted spiritually? Believe me, you don’t want to miss out on that spiritual adoption! Spiritual adoption is much more than just a nice idea. We need it desperately because none of us come into this world belonging to God’s family. By nature, we arrive here separated from God’s favor. In fact, the Bible says that we all begin life spiritually dead (see Ephesians 2:2, 5). Jesus taught this too, He even shocked some strict religious leaders by telling them that they were in Satan’s family: “… you are of your father the devil….” (John 8:44). In many ways, being adopted into God’s family is similar to civil adoption. Here are some examples. Spiritual adoption is permanent. God is the One who causes “… us to be born again to a living hope through the resurrection of Jesus Christ from the dead, to obtain an inheritance which is imperishable and undefiled and will not fade away, reserved in heaven for you” (1 Peter 1:3–4). When a couple goes through all the trouble and expense to adopt a child, it demonstrates that they care deeply for that new family member. In a similar way, by picturing His followers as adopted, God displays that He tenderly cares for His own. “Just as a father has compassion on his children, so the Lord has compassion on those who fear Him” (Psalm 103:13). Jesus said that if you “… know how to give good gifts to your children, how much more will your Father who is in heaven give what is good to those who ask Him!” (Matthew 7:11). There are some ways that God’s adoption is even more wonderful than human adoption. When we are adopted into God’s family, we start longing to be more like the Lord who adopted us. “Therefore be imitators of God, as beloved children” (Ephesians 5:1). If you are in God’s family, you want to “… glorify your Father who is in heaven” (Matthew 5:16). When God adopts someone, He also implants a brand new nature inside of him or her. “Therefore if anyone is in Christ, he is a new creature; the old things passed away; behold, new things have come” (2 Corinthians 5:17). Along with the adoption into God’s family, He also gives “… His precious and magnificent promises, so that by them you may become partakers of the divine nature, having escaped the corruption that is in the world by lust” (2 Peter 1:4). There is nothing like knowing that you belong to God’s family!Not only do you have an assurance of eternal life, but God becomes your loving companion. “For you have not received a spirit of slavery leading to fear again, but you have received a spirit of adoption as sons by which we cry out, “Abba! That all sounds great, so how can we become adopted by God? We must give our hearts to Christ, by turning away from our sin and trusting that He paid the penalty for all of those sins when He died on the cross. “For you are all sons of God through faith in Christ Jesus” (Galatians 3:26). “But as many as received [Christ], to them He gave the right to become children of God, even to those who believe in His name” (John 1:12). If you surrender to God and become a follower of Jesus, then you will gain a confidence that He loves you and has adopted you into His family. “See how great a love the Father has bestowed on us, that we would be called children of God; and such we are. For this reason the world does not know us, because it did not know Him. Beloved, now we are children of God, and it has not appeared as yet what we will be. We know that when He appears, we will be like Him, because we will see Him just as He is” (1 John 3:1–2).